Looking for family-friendly events around the Atlanta area to kick off your holiday season? Here is a list of twelve events and holiday tree lightings going on around town that are guaranteed to put you in a holly jolly mood. 1. Light the Station 2018 — Atlantic Station- Nov. 17, 1- 8 p.m.; lighting at 7:45 p.m.
Don’t miss the season’s biggest event as we officially kick off the holidays with Light the Station! This year’s event will be held in a new location on WINTER WONDER LANE – just off Market Street and adjacent to Dillard’s. Enjoy the Atlanta Christkindl Market also opening on Nov. 17! 2. The Lighting of Avalon —Nov. 18, from 1-8 p.m. Tree Lighting at 7 p.m.
A celebration for the season you won't want to miss! Get in the holiday spirit with festive music and free activities for the whole family. From the annual opening of Avalon on Ice to the magnificent tree lighting, and an appearance from Jolly Old Saint Nick himself, there's something exciting for all to enjoy. ‘Tis the season to lace up your skates and glide into the holiday spirit at Avalon on Ice. The Rockefeller-inspired ice skating rink is open Nov. 18, 2018 through Jan. 21, 2019. 4. Marietta Square Christmas Tree Lighting —Nov. 30, 4-8 p.m.; Tree Lighting at 6 p.m.
Join Santa and Mrs. Claus for the kick-off to the holiday season in charming Marietta Square. Festivities start at 4:00 pm in Glover Park in Historic Marietta Square. Local choruses will perform Christmas carols on the main stage. Santa will light the giant Christmas tree at 6 pm. 5. Children’s Christmas Parade —Dec. 1, Peachtree & 11th Street at 10:30 a.m. The Children's Christmas Parade will step off at Peachtree Street and 16th Street and end at Peachtree Street and 5th Street. Watch as Midtown Atlanta is transformed into Santa Claus Lane with the sights and sounds of the season. Your kids will love this Atlanta tradition and enjoy the large floats and performances in the parade. It is the largest of its kind in the Southeast! Can't make it to Peachtree Street? You can tune in to WSB-TV Channel 2 to view the Children's Christmas Parade live. 6. Season of Celebration - Light the Night City of Alpharetta —Dec. 1, 4-8 p.m. Enjoy the charm of the holiday season at the lighting of the Christmas tree and other holiday festivities in Alpharetta. 7. Rudolph and the Center for Puppetry Arts —Nov. 15 through Dec. 30. Enjoy a classic story told a classic way at the Center for Puppetry Arts. Your ticket will include the performance of Rudolph the Red-Nosed Reindeer™, a Create-A-Puppet Workshop™ your children can build and perform with their very own King Moonracer™ Rod Puppet, and admission to the Worlds of Puppetry Museum. 8. Candlelight Nights at the Atlanta History Center —Dec. 15 and Dec. 22, from 5:30-8 p.m.
Santa Claus will welcome kids, and families can enjoy the Holiday Market filled with local crafts and artists’ creations. Visit each of the three historic houses to experience how Southerners celebrated Christmas during the Civil War era (Smith Family Farm), the 1930’s (Swan House) and pioneer days (Wood Family Cabin). Timeless holiday music will resonate, and interpreters will bring characters from the pages of history to life at these historic abodes, each handsomely dressed in period holiday decorations and featuring activities of the season. Visit the Fernbank Museum and enjoy holiday décor, sparkling trees showcasing celebrations around the world in the enchanting Winter Wonderland exhibition. Their displays recognize the diversity of celebrations, holidays, traditions and events from around the world. So, come to enjoy the Museum, the decorations, and the holiday cheer! Each year the Garden adds something new to its botanical-inspired light display. The wonderland goes throughout the 20-acre Midtown attraction. Enjoy the always beautiful Atlanta Botanical Garden adorned in holiday cheer. Christmas at Callanwolde has been an Atlanta holiday tradition for 40 years, and begins with the Christmas at Callanwolde Designer Show House, a 27,000-square-foot historic mansion decorated by Atlanta’s top interior and floral designers. Visitors of all ages can enjoy a self-guided tour of the mansion and enjoy elaborately decorated holiday displays, an artists’ market, and other holiday themed activities for the entire family. See the website for daily activities and events and bring a new toy for donation to Toys for Tots. 12. Holiday Lights of Hope 2018 - Woodstock —Dec. 7-23, 6-9 p.m.
Family light show that befits the Anna Crawford Children’s Center. The event includes an awesome walk-through light display featuring more than TWO MILLION LIGHTS, along with entertainment for families with kids of all ages. I’ve also heard the Santa there is great for pictures! 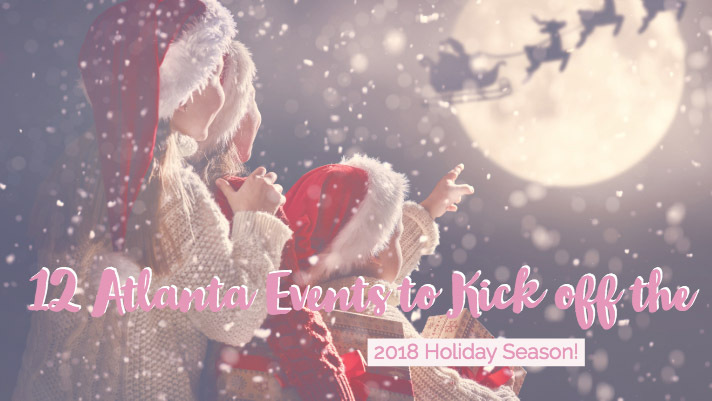 There are so many great events going on in the Atlanta area for the 2018 Christmas Holiday season! Make sure to check back for more Atlanta family friend holiday events on the blog!